G20 In London: Why The Protests? Rachel Holdsworth G20 In London: Why The Protests? We know why the G-20 are in London, so why are people protesting? You might think this was a no-brainer: because they're angry about the recession, right? Well, yes and no. (By the way, these videos are a quite funny summary of how we ended up in this mess). There's actually a very broad range of groups intent on protest, all taking advantage of the presence of the G-20 leaders in the city. 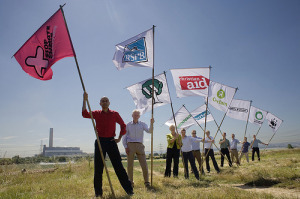 G-20 Meltdown is a coalition of organisations ranging from Greenpeace to Transport 2000, the Socialist Workers' Party to CND. Their manifesto is generally anti-capitalist and furious at the way the unregulated free market led to the biggest economic downturn in living memory. They want homes, jobs and a future for all in a borderless, sustainable world free of powerful banking interests and corrupt politicians. Breaking G-20 Meltdown into just a couple of its many parts, Climate Camp are a bunch of volunteers taking action against climate change. These are the people who held the camp at Kingsnorth power station last summer. Reclaiming Spaces is dedicated to reclaiming cities and public spaces for the people who live there. They're calling on the G-20 to recognise the human right to adequate housing and environment. Put People First is an umbrella group for 120 organisations including the TUC, WWF, Save the Children and Muslim Council of Britain. They're concerned about inequality and are campaigning for a low carbon economy based on fair distribution of wealth and decent jobs for all. Stop the War want troops out of Iraq and Afghanistan and an end to the seige of Gaza, while London Anarchists are calling for direct action against the banks and government in support of the working classes. These protestors aren't going to get the ear of G-20 leaders, but with the world's media focused on London over the next few days they'll be hoping to raise awareness of their issues with some eye-catching protests. And what will they be? We'll tell you in the next installment. Ooo, the tension.